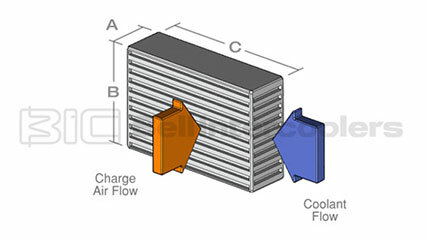 To select your intercooler core, you must determine the core thickness. These dimensions are A (core thickness), B (core height) and C (core length). In order to use the online inventory system you will first need to determine the flow patterns for your specific intercooler application. These flow patterns will provide you a point of reference to the accompanying diagram and will provide you with the key dimensions of your specific intercooler application. 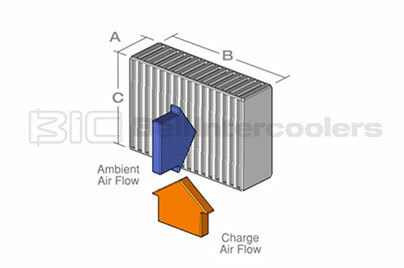 The flow patterns that must be identified are Charge Air Flow and Ambient Air Flow or Liquid Flow. In layman’s terms, Charge Air Flow is the intake air moving within the induction system, from the turbo or supercharger to the cylinders. 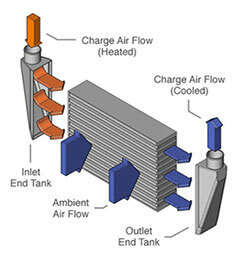 Ambient Air Flow or Liquid Flow is the air or liquid that passes through the core to cool the intake air (Charge Air Flow). Our engineers routinely work with high performance shops, racing teams, and OEM engineering teams in the development of their intercooler and testing systems. We also provide production and manufacturing optimization for private label projects. 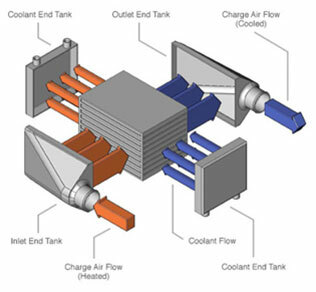 Giving you access to leading engineers in the intercooling and forced induction field is part of our commitment to provide you with the best in intercooler technology and components. 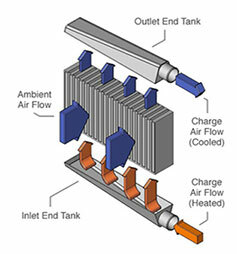 Get in touch with us and let us help you with your next intercooling, testing or production project.